A brightly lit LCD display reports real information including battery health, charging time, charged volume, charging current, battery voltage and type, cut-off voltage and charging mode. The UMS4 offers an energy saving function that activates and dims the LCD display in 10 minutes, when there is no action to the buttons or batteries. 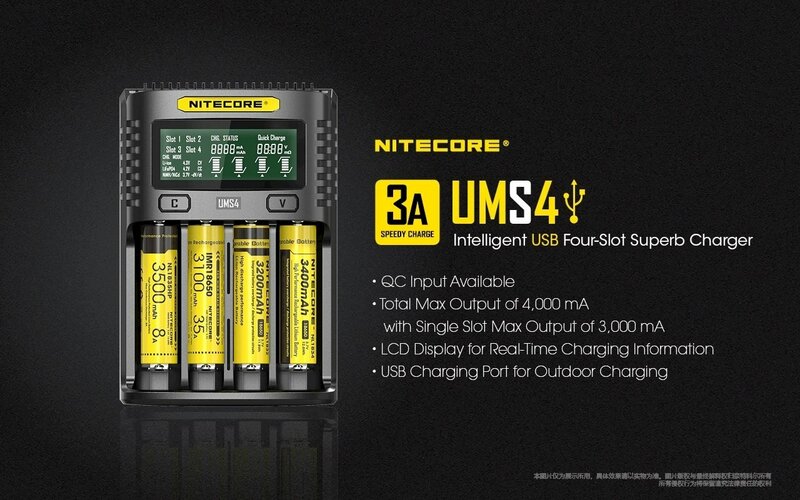 The UMS4’s intelligent charging technology automatically detects and applies the appropriate charging current/voltage while allows users to manually adjust the charging current/voltage for specialized battery types. The UMS4 supports various battery types (li-ion/imr/lifep04/ni-cd/ni-mh) and common battery sizes including (18650, 16340,14500).